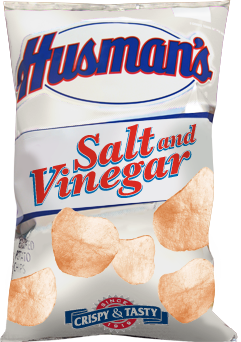 Husman's have been making Potato Chips since 1919. They have every right to include their logo, but they haven't got one - just some italic writing like so many other 'traditional' companies. There is no doubt about the flavor, as it shouts from the bag. There is a little glossy color coding, but even here it is a plain white and silver. Certainly not one graphic designers will be pinning to their 'inspiration wall'. There was sufficient seasoning used with this flavor to soak up the blend of oils to leave a nice 'Crispy and Tasty' crunch, as it says on the bag. A light and golden colored Chip with brownish blemished areas. There was residue visible; a kind of pale powdery substance that could be scraped off with the fingers. A little oily, but not as much as some. Salt & Vinegar appears to be one the flavors that Chips manufacturers seem to struggle most with. It's all about balance, otherwise they may as well be called 'Vinegar Chips, such is the over-powering flavoring with some. However, these did have a reasonable balance. Neither salt nor vinegar were overpowering, despite a pretty high sodium content.